e-waste recycling can include your old IT equipment like computers, printers, scanners and mouse devices. Not to mention your old fax machines and photocopiers, TVs and DVD players. Instead of throwing them into landfill, let us recycle their glass, metal, plastic, gold and silver components to make new office equipment. 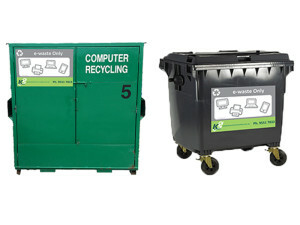 For e-waste recycling we can offer you either a 660 litre bin or if you require something larger, a 4.5m3 lockable container. Once the containers are full simply give us a call and we’ll come and collect them. To read about the e-waste recycling process click here.